Posts Tagged "Crown or Roses"
Home » Posts Tagged "Crown or Roses"
Put a whole bunch of roses and a few strategic leaves on heads for a very special bride or gala. This lovely look by Guido, Redken’s Global Creative Director “was inspired by pure, couture Italian princesses for the Dolce & Gabbana Alta Moda Couture Show for Fall/Winter 2017.” He allowed the hair to dry to encourage its own natural, soft texture, then pinned the hair back and up using bobby pins for adequate hold. He lightly sprayed a few loose pieces which were allowed to hang around the ears, nape of the neck and front of the face for a soft, romantic look. The flower crown of roses was secured to the head with additional bobby pins. 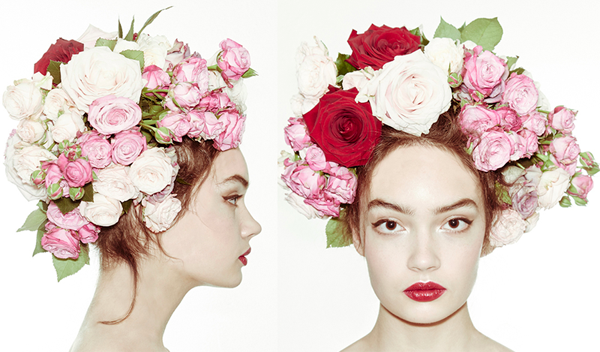 Or the flowers could be added on a large headband.